WASHINGTON (The Nil Admirari) - Congress asked Americans - especially seniors - to "look over there" as it tried to sneakily place a $700 million cut to Medicare in the Fast Track Trans-Pacific Partnership (TPP) bill. The cut is being pushed by Republicans and some Senate Democrats. 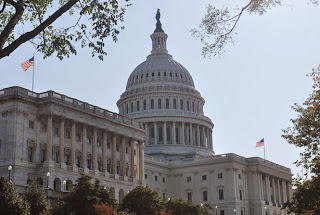 "It is very important for Americans to look over there," stated Senator Mitch McConnell (R-KY), as he passed a document to Speaker John Boehner (R-OH). The place Republicans and Democrats plot to rob more Medicare funds (above). Capitol Building by Peter Griffin. Boehner smiled and hid the document McConnell had given him behind his back. "We will only pay for something if we can cut something else," said Boehner. He shrugged before adding, "Where the hell else are we going to get the funding unless we raid Medicare? And if your answer is 'higher taxes on the rich' you clearly haven't been paying attention." Democratic collaborators in the senate were too cowardly to comment. Democratic presidential candidate Senator Bernie Sanders chided Republicans and their Democratic friends for being "huge assholes" and "continuing to raid social programs and then complaining they are failing and going to go broke."